Raphael Team Go for the Big Push for St Giles Hospice! 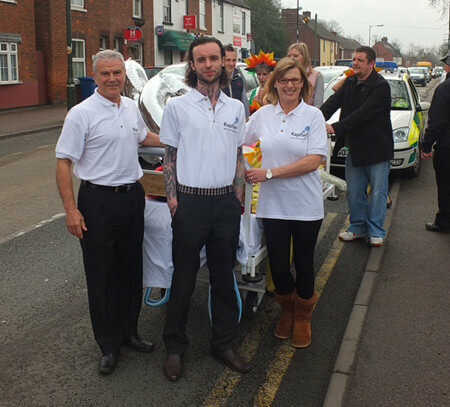 Any one who visited Lichfield City centre on Friday 12th April 2013 may have caught sight of Pete, Clare and Edward of Raphael Design taking a break from the office to help St Giles Hospice in their 30th Anniversary Relay Bed Push. Accompanied by three of their colleagues from White Crow Studios, they pushed a hospital bed from the Holy Cross Catholic Church to Jayman Estate Agents in the city centre. No speeding offences were committed as far as we know! The St Giles teddy, who was travelling in the bed, seemed to survive the ordeal and a successful handover was made to another team of enthusiastic bed pushers, so all was well! Raphael Design would like to wish St Giles Hospice the very best of luck in all their forthcoming fund raising activities.